We have included 11 construction checklist samples in different varieties so that you will be able to choose one that is just right for you. The samples are available in Word and PDF to make it easy for you to view, download, and edit them. These samples can also guide you with making your own checklist. 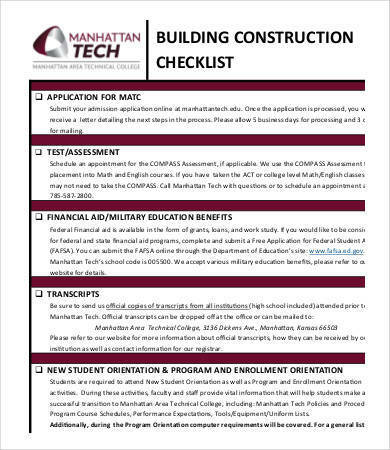 What Is a Construction Checklist? There are tons of things that are needed in construction as well as tons of processes and standards that need to be followed. It would seem too much or it would seem impossible to remember all of them mentally, and they definitely can’t all be handled by one person alone. With all the work done and the things needed, construction work can never be easy. 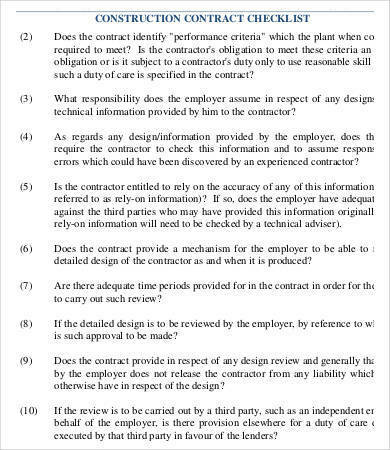 A construction checklist aids the work done in construction sites because it lists all of the things that are going to be used in a construction project and ensures that all of the required procedures are followed. 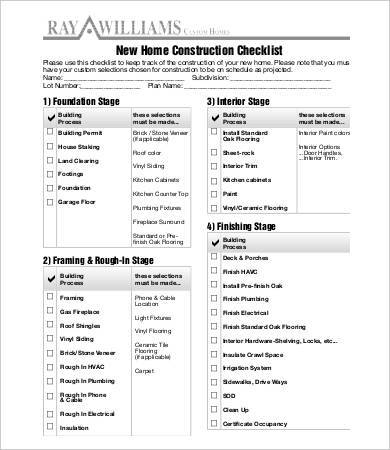 Think of a construction checklist as a comprehensive, very detailed, and specific to-do list or task checklist. 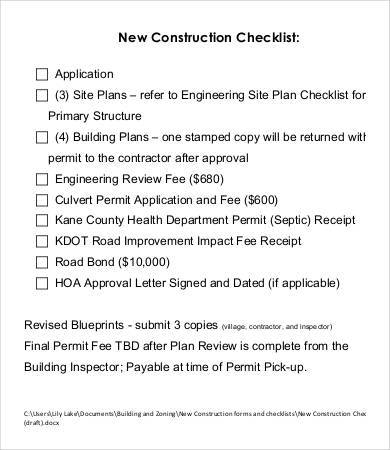 A lot of things are involved in a construction checklist. Things that are commonly included are safety plans and safety programs, inspection checklist and inspection reports, and standard operating procedures. 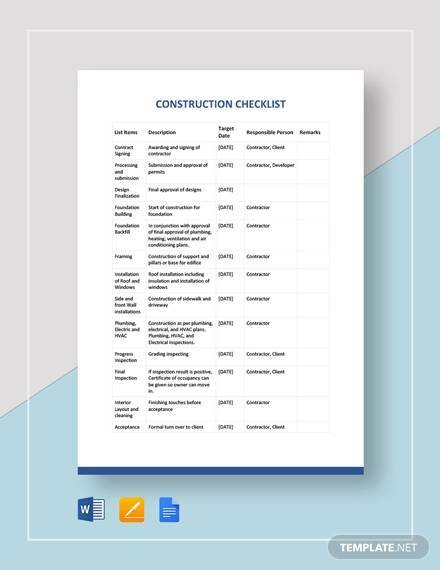 Also, although it may be mostly used in construction sites or where the actual construction is happening, a construction checklist is also used during the pre-planning stage of the construction project. 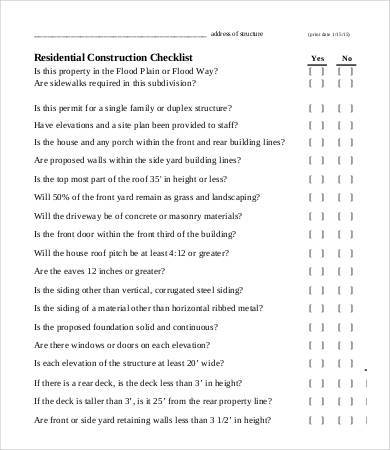 Why Do You Need a Construction Checklist for Your Construction Project? 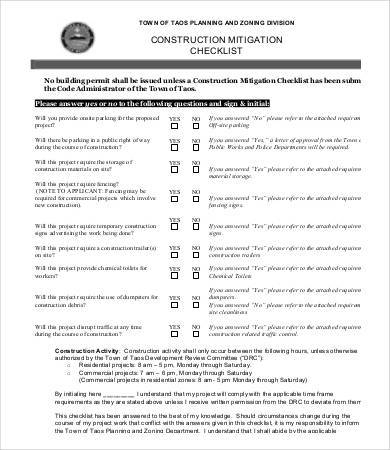 Every construction project uses a construction checklist that it has become commonplace in the construction setting. This is because a construction checklist is a must-have tool that helps in the construction project in every single way. Below are the reasons why they are needed. 1. 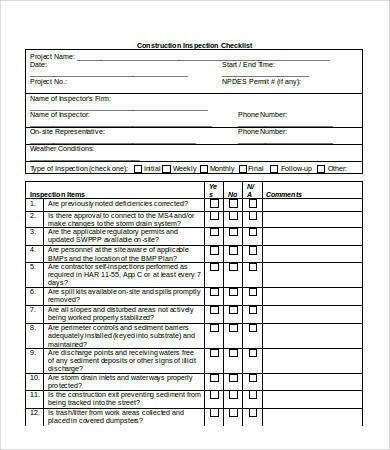 A construction checklist ensures that the standard operating procedures are being followed and monitored closely for the whole duration of the project. 2. 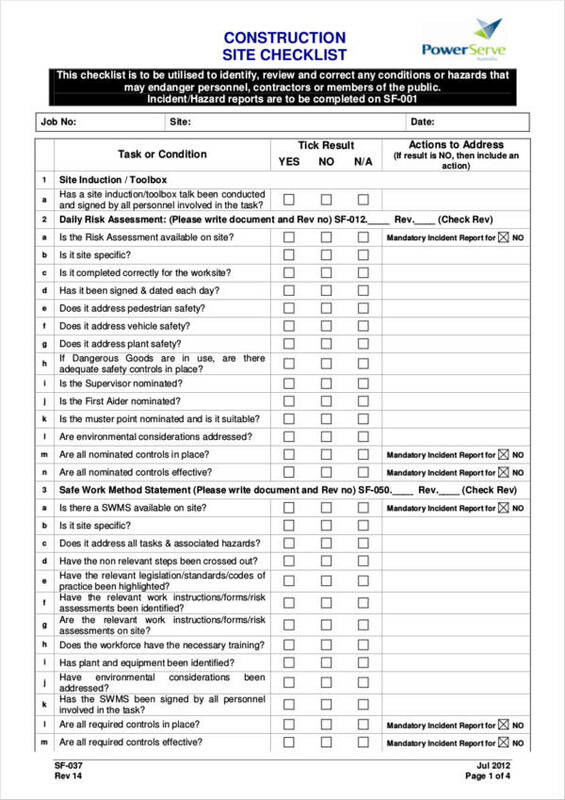 The checklist serves as a guide during inspections and other safety checks of the equipment used, as well as the entire construction site. 3. All of the safety measures and precautions can be listed in a construction checklist. 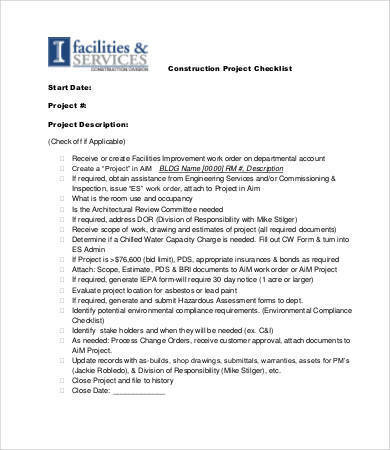 What Items Can You See in a Construction Checklist? When making a checklist or when using one, it is important that you are aware of the things that are included in it so that you would also know what they are for and the reason why they are included. 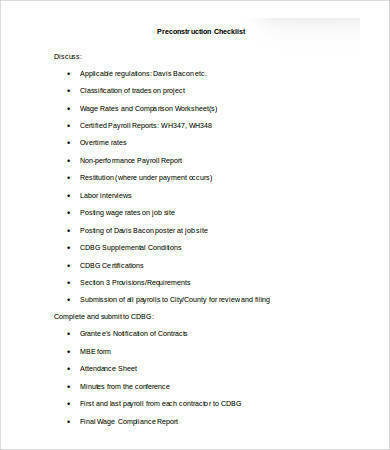 This is how the construction project is going to be identified and for what particular project the entire checklist is for. This includes details, like what the project is for, what it is going to be, and how it is going to look like once it’s done. Making use of a project checklist will surely assist you in this endeavor. This is where the construction project is going to take place. If there are a lot of contractors or companies involved in the project, their names would all be listed here. 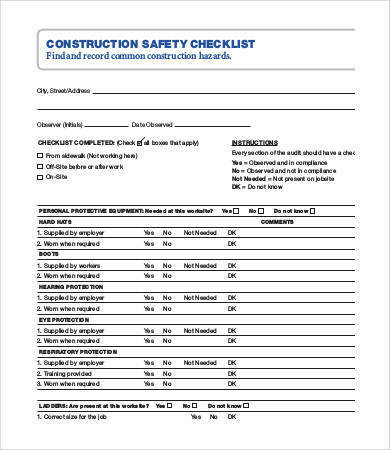 Although the list of tools or equipment may be provided in another checklist, they are often included in the construction checklist for the convenience of the user and so that all the files and sheets can be found in one place. Utilize an equipment checklist to easily keep track of the things needed for the project. In construction, the start date, end date, and the due date of specific project parts are considered important dates that whoever manages the project needs to keep track of these so-called important dates. Knowing what is included or what is in a checklist is not the only thing that is important. Having knowledge about what is included in a sales budget or what is included in a marketing plan are also equally important. Want to be better with using a checklist? Well, you have just landed yourself on the right part of this article. Below are some tips that will surely help you use a checklist effectively, boosting efficiency and reducing mistakes. 3. Read and follow instructions before carrying out the tasks. Some tasks are shared or delegated to other groups, so reading the instructions provided will allow you to determine which tasks are yours and which tasks are not. 4. Make sure that you have the same copy of simple checklist that is being used so that the tasks you need to do are those that are intended to be done. This also prevents confusion. 6. Take note of the important dates, like start dates and due dates. These dates are crucial to the work your are doing and being aware of them will make you work accordingly in order to finish the given tasks on time. You may also want to check out other checklist-related articles, like HR checklist samples and templates, babysitter checklist with schedule samples, and employee checklist samples and templates.